POLITICAL TIDBITS: MRT-3 Gen. Mgr. 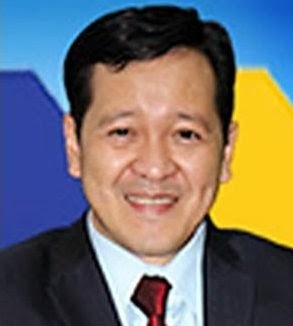 Al Vitangcol as fall guy in Inekon extortion case---victimized by new wave of ‘Kamag-Anak, Inc.? MRT-3 Gen. Mgr. Al Vitangcol as fall guy in Inekon extortion case---victimized by new wave of ‘Kamag-Anak, Inc.? Writer Manalo cited a letter sent by Inekon Board Chair and Director-General Josef Husek to Atty. Vitangcol, belying Husek’s earlier statement made to the NBI that it was Vitangcol who dictated the terms for Inekon to qualify for the bidding of additional MRT train coaches. De Vera and Maralit are said to be close to some relatives of the President, principally his first cousin Jorge Aquino-Lichauco (son of Ninoy Aquino’s sister Maur), who is said to have drafted the “sample terms” for the Light Rail Vehicles (LRV) negotiation’s terms of reference (TOR). There’s opinion that Lichauco, who’s suspected to have been the “unknown entity” that De Vera and Maralit were allegedly reporting to that night at the ambassador’s residence, had submitted a sample TOR so stringent that it would have excluded all other bidders. Inekon Chief Husek claimed that he protested this demand for a $30 million cough-up. The conclusion Manalo arrived at in his Tribune article was that Al Vitangcol, who is a novato in government circles, having been recruited by former DOTC Secretary Mar Roxas on January 2, 2012 from the ranks of IT practitioners, is being made the fall guy by a circle close to the President. The implication in Manalo’s piece is that it’s a sort of a second-generation Kamag-anak, Inc. attempting to corner the LRV enchancement program of the DOTC. When this Inekon issue first broke out in media, the names of presidential sister Ballsy Aquino-Cruz and husband Eldon Cruz came out as allegedly brokering for the Inekon Group, which is represented here by Yorgos Psinakis (nephew of the late Steve Psinakis, a close friend of the Aquino family from way back, whose wife, Precy, is connected with the family that owns ABS-CBN). This suspicion was fueled by the fact that the Cruzes had travelled to Prague, capital of the Czech Republic, in 2011, with some businessmen about the time that the Czech company began making overtures to supply the Philippines with more MRT trains. But the Cruzes explained that like many other Filipinos they were just there to make a pilgrimage to the Sto. Nino de Praga. The MRT controversy died down after a while, but it resurrected after its GM, the benign-looking soft-spoken lawyer and former IT practitioner Al Vitangcol, 50, appeared to media to be groomed as the “fall guy” for the hot story on the Inekon extortion issue. When that story first broke out about Vitangcol leading the pack of extortionists vs. Inekon, I was immediately skeptical about it. I hardly knew the guy personally, but during the month-long hearings conducted by the House committee on electoral reforms on the 2010 elections and the PCOS fiasco, as chaired by former Rep. TeddyBoy Locsin, I found IT resource person Vitangcol to be quite credible and straightforward---apart from his looking like a seminarian. Reading the front-page story of Charlie Manalo and subsequent Tribune columns on the MRT-3 issue by Herman Tiu Laurel, I became quite interested and began checking out the DOTC websites as well as sources in the know. I tend to agree now with the conclusion of Manalo that Vitangcol was being set up to be the object of blame for the MRT-3 fiasco, for a number of reason. For one thing, as GM of the MRT-3, Vitangcol only ranks at third level in the hierarchy of DOTC officials, so that he does not carry the power to decide on procurements of big-ticket items, such as the MRT-3 expansion project that’s said to have been costed by Inekon Group at US$174.460 million for 52 trams. I find it incredulous that this third-level DOTC official could possibly guarantee award of such a huge project on his own for a fee. At worst Vitangcol could have been acting on behalf of his superiors, but there's no evidence of this from documents checked out. Those statements hardly qualify someone as itching to make money from Inekon; in fact Vitangcol was actually shooting down Inekon's proposal and making his superiors realize there were other CHEAPER bids. Again, these were hardly conditions set by one out to mulct the highest bidder. For his determination to make DOTC consider lower bids, Vitangcol was given a rough time. On Nov. 28, 2012, Asst. Secretary Jaime Raphael Feliciano ordered him to submit documents to JUSTIFY his assertion that lower bids for the LRVs ought to be considered (shouldn’t it be the other way around?). Vitangcol argued that the NEDA-approved budget contract of USD1.895M per LRV---which would bring in 48 additional LRVs instead of only 26 units---would save the government the amount of USD 41.69M or roughly P1.79B. With the full backing of the MRT-3 engineers this estimate was endorsed to DOTC’s bids and awards committee on Dec. 21, 2012. On February 2, 2013, the DOTC came out with a published invitation to bid and the Terms of Reference. Bidding took place on June 13, 2013 with China North Dalian as complying bidder. Nawala ang Inekon. But the woes of Vitangcol, who hasn’t even been to Prague, didn’t end there. The conscript media began its demolition job on him, making him appear as the villain in an alleged extortion case vs. Inekon, instead of the victim. On July 22, 2013 in a meeting with Secretary Abaya, Vitangcol offered to take a 30-calendar days leave which Abaya announced. On August 27 he returned to work but the day after, Mark Abaya, son of the Secretary and his chief of staff, asked Vitangcol again to take another 15 days leave; on Sept.10 he returned to work, but next day young Abaya again asked Vitangcol to take a leave, this time of indefinite duration. This time, however, the MRT-3 GM refused to do so and asked management instead, through his lawyer Pablo Sanidad, to file charges against him. Until now, however, there are none. It’s a sad plight for a new and idealistic guy recruited into government service. I checked out Al Vitangcol’s record at MRT-3, and it seems that he did save taxpayers' money a lot. Consider this: Before he came in as MRT-3 GM on Jan. 2, 2012, recruited by Secretary Mar Roxas, MRT-3 was paying P14Billion/year for maintenance fees; after he came in he was able to reduce it to P700M/year. Insurance coverage before 2012 was P200M/a year; now it’s P96M/year. The fare-box collection at MRT used to be only P3-4M daily before 2012; today it’s P6-7M a day; in projects, it used to be P196M for security; now it is P30M. If he was recruited by Roxas and Roxas is the most close to the President, then why he was not defended or saved? does it mean blood is thicker than water? thanks for the information. Kamag Anak Inc., I forgot the title. Delima, Roxas and others who are not in the corporation should be careful that some day they will be left and their career will forever be tarnished. Vitangcol declined to comment on the allegations."